I'm so pleased to present to you the newest (second!) member of the Darling Dolls International Series. Following Hana the Korean Doll, here is Sanjana the East Indian Doll! Sanjana's design was so much fun to come up with! I looked through many East Indian traditional clothing styles, and originally wanted to go with a beautiful sari. A sari is a female garment from the Indian subcontinent that consists of a long cloth that is wrapped around the waist, while the other end is draped over the shoulder. It is so lovely, but when it came down to crocheting a cloth that is meant to have enough drape to work in that way on a small doll, I decided I needed to go with a different design. Fortunately, I learned about the dupatta, which is a long scarf that is worn over the Hindu outfit of lehenga, a long skirt. With more sketches of the character design, I finally arrived at an outfit that I felt would be a good representation of traditional clothing in India! Well, fingers crossed... I hope I did it justice! Some of the features I added to this doll include her long, black hair, neatly done in a braid. While I had many beautiful colors to choose for her clothing, a few red and yellow bridal outfits really caught my attention, and so I decided to go with it! Sanjana has golden earrings and a headpiece as well. In the future, I'd like to sew some beads and embellishments onto her outfit. 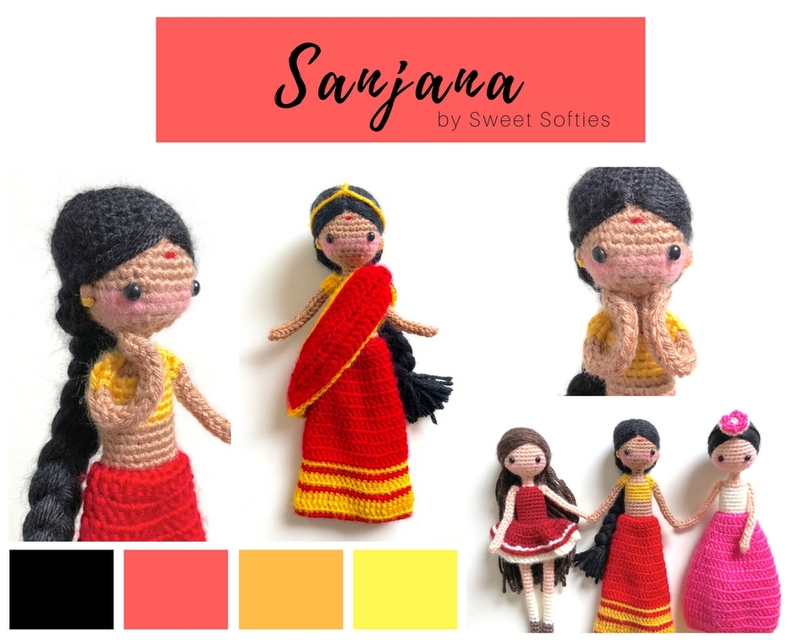 Anyhow, I also wanted to mention that Sanjana's name was suggested to me by Selvameena, my wonderful friend from the Crafts Hobby Club on Facebook. She taught me that the name Sanjana means meek, gentle, and soft, which I think works beautifully with my doll. I did receive many other great name suggestions from the crochet community as well, and wish I could pick them all! Well, this just means I get to make more Indian dolls since I have many names lined up already! I hope you like my doll, and will be putting up a post about her pattern soon. Thank you, and hope you all have a wonderful day!